as we head into June. I'm always on the hunt for visual inspiration to keep me going in my own planning and organising journey. Being organised is something that's a constant, it's a pursuit that never ends, which is either an exciting or daunting fact depending on how you look at it. I have had this quote in my mind consistently. Almost as soon as I complete something I can already come up with ways to improve what I did - which robs me of joy. This quote reminds me that I do the best I can at the time. I'm going to add this to my planner so that I never forget it! There are two things that come from IHeart Organizing this month - a blog I have mentioned before. The first picture is from a great post about saving on purchases for your home. The pictures on right showing wrapping goodies are from a brilliant post about creating a 'wrapping station'. I really love the look of this space and of course how beautifully organised it is. I have a drawer dedicated to gifts and when I spot something pretty I buy it and save it for gift giving. I few of my friends have also started doing the same thing and it really does save time. Do you stash gifts or cards? Whitney English is a US based brand which I have seen quite a few bloggers mention. It's a range of diaries / agendas with a system set out by the creator behind the business. See and read more about the brand here. I love the stylish simplicity of the covers. I have mentioned It's looking love-lee today, but this sweet creative is always an inspiration from her planner through to her Instagrams. I'm driven by seeing how others get organised and this blog offers beautiful and fun examples. Time management - that elusive thing we are always working towards. I found this post via dear handmade life a great read to remind me of how to work and think. This blog is a great resource to bookmark as it has loads of other useful posts too. 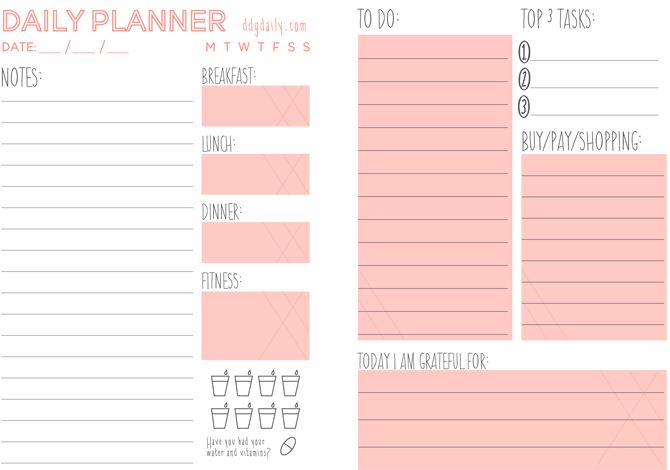 Lastly, take a look at this lovely printable from DDG DIY. If you are looking for a new addition to your current planning or if you haven't really gotten into listing this year then perhaps try using this. To download this freebie visit this post. I hope this offers some inspiration for June! Have a wonderful and organised month! *To see other MFM posts click here.